LIVELY PETS Derma-Soothe Medicated Shampoo for Dogs and Cats contains both Ketoconazole and Chlorhexidine in one shampoo, giving you a powerful weapon against a myriad of ailments that can plague your pets skin.KETOCONAZOLE is an "azole" anti fungal that not only treats fungal infections like yeast and ringworms, it is also extremely effective against skin conditions like seborrhea dermatitis, dandruff, flaking, scaling, and itchy patches. It acts as a fungal growth inhibitor.CHLORHEXIDINE is also an anti fungal and an anti bacterial agent that is effective at preventing infections of minor scrapes, rashes, and cuts as well as inhibiting any fungal growth. It is a powerful antiseptic and relieves those red itchy hot spots. Derma-Soothe will clean, deodorize, and sanitize your pet to leave them looking and feeling better than ever.Fresh Cucumber melon scent that lasts! TIP: Make sure to scrub beneath your pets toenails when treating for a yeast infection. Yeast hides under the nails for a very long time, and even if you heal the infection in the skin, your pet will continue to get reoccuring yeast infections by scratching themselves if the yeast is allowed to stay beneath the nails. SAFE FOR DOGS AND CATS - Derma-Soothe Advanced Plus Medicated Shampoo for pets is formulated for powerful ANTI FUNGAL and ANTI BACTERIAL treatment that is safe for DOGS, CATS, RABBITS, HORSES, PIGS, and more! FRESHLY SCENTED MEDICATED and MOISTURIZING SHAMPOO - Not only does Derma-Soothe treat your pets skin infections and soothe his/her dry, itchy skin, but our shampoo will leave your pet smelling fresh! Amazing Cucumber Melon scent you and your pet will love! MEDICATED TO TREAT YOUR PETS SKIN ISSUES - Derma-Soothe contains both Ketoconazole and Chlorahexidine. Both of these are powerful anti fungals, treating everything from red, itchy yeast infection rashes, to ring worms plaguing your pet pals. Chlorahexidine is also an incredibly effective anti bacterial that will help prevent infections in minor surface wounds and also help clean and disinfect infected wounds. DRY ITCHY SKIN RELIEF FOR DOGS, CATS, AND MORE! 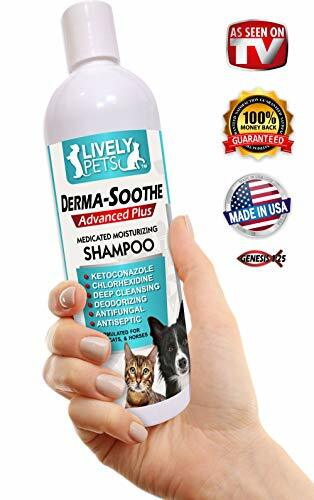 - Let LIVELY PETS Derma-Soothe Medicated Shampoo help relieve all the scratching caused by dermatitis, dandruff, seborrhea, infections, rashes, insects, fleas, and more! Treat the problem at the source. KETOCONAZOLE and CHLORHEXIDINE make 1 powerful team in treating your pets skin issues! Antiseptic, Anti Bacterial, and Anti Fungal all in 1 fresh smelling shampoo! DEEP CLEANSING AND DEODORIZING! NOW "AS SEEN ON TV" - Derma-Soothe will clean away all the dirt and grime your pal has collected since his/her last bath, and leave them clean and smelling fresh! Our Derma-Sooth Medicated Shampoo is now a part of the "As Seen on TV" Family! If you have any questions about this product by Lively Pets, contact us by completing and submitting the form below. If you are looking for a specif part number, please include it with your message.